Renault invented the MPV so the company knows a thing or two about this class. The previous Grand Scenic was a regular in this Guide, providing class-leading fuel economy with 7-seat flexibility. It is impressive that the new model has moved the bar even higher and is now capable of dipping under the 100 g/km benchmark. Renault has gone on a style offensive in recent years and the results are evident in the Grand Scenic. For an MPV it is a decent looking car and the theme is continued inside where an airy cabin and stylishly simple dashboard await. Sadly whilst the lack of buttons looks great it does mean that functions such as adjusting the ventilation system require lots of stabs at the touchscreen. The 1.5-litre turbodiesel makes do with 108 bhp but it is the 192 lb.ft of torque accessible at just 1,750 rpm which is more important here. If you are going to use all 7 seats all of the time performance will be leisurely, but it does a decent job the rest of the time. The pay off for a slightly class-lagging 0-62 mph time is the outstanding fuel economy, on paper at least. Rather than going down the full hybrid route, Renault has adopted a mild hybrid. In this case it is a 48v integrated starter generator which replaces the normal starter motor. As well as starting and stopping the diesel lump it can also add a modest 13 bhp and 52 lb ft of torque which is designed to reduce the load and as a result save fuel. The battery is positioned in the spare wheel well so there is no loss of boot space but you can’t have a spare. We tested the system on the smaller 5 seat Scenic and found that it does work but only if you drive, very, very carefully as the system only really helps out at low revs. Because we replicate average usage we spent a lot of time not driving very, very carefully and as a result by the end of the week the urban average was just 31.1 mpg, the best long run was 61.4 mpg and the average was 45.9 mpg. The Grand Scenic is a small MPV at just 4.6 metres in length so in common with the rest of the class, whilst it does have 7 seats, the two in the last row are best kept for occasional use and preferably for kids. If you don’t need them all the time they fold away neatly into the boot floor. With the rear seats up, boot space is a paltry 233 litres, but fold 5 seats down and you get a cavernous space. 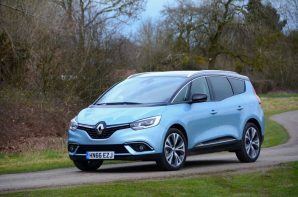 The Renault Grand Scenic is a good-looking MPV which is ideal if you occasionally need to carry 7 people or you have lots of kids. The fuel economy is outstanding on paper but you need to adapt your driving style and pace to let the system work at its best. It isn’t the best MPV to drive, it isn’t particularly cheap, and the dashboard is pretty but difficult to use but if you are prepared to put the effort in it can deliver good fuel consumption.